Gelid announces IcyPad, a low-budget laptop cooler with a MSRP of 9.99EUR ($12.99). 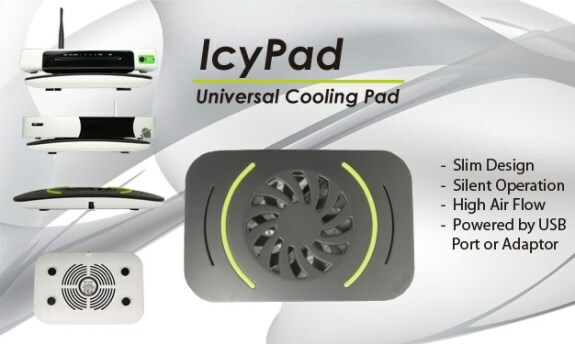 Thermal Solutions specialist GELID Solutions unveils its silent “IcyPad” universal cooling pad. The cooler is a product of GELID Solutions SILENT product line. As overheating is a major issue for any small devic e GELID Solutions has created a cooler in a slim design which can be used for routers, switches, mod ems, internet media player and many other small form factor devices. The small form device i.e. int ernet media player can be placed on the top of the cooler. The silent 80mm fan inside of the “IcyPad” provides fresh air to prevent any overheating. The “IcyPad” can by powered by USB port or by the UK, EU or US 5V power adaptor which is included. “Act now before it’s too late! When overheating in your small form factor device causes your headache our “IcyPad” can be the solution for you. This cooling pad can be used with any device that needs extra cooling“, said VC Tran Marketing Director of GELID Solutions Ltd.